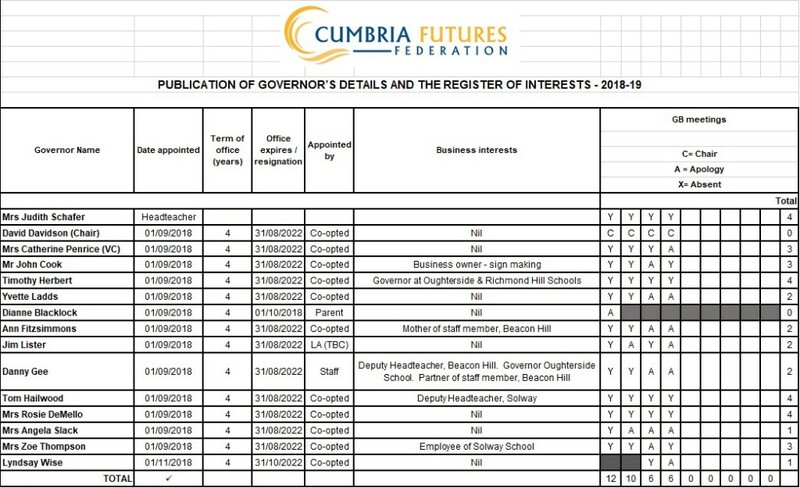 As part of Cumbria Futures Federation, our Governing Body covers both Beacon Hill Community School and also Solway Community School. Overseeing the financial performance of the school and making sure its money well spent. The Governing Body of Cumbria Futures Federation is made up of 15 Governors: 1 Parent Governor, 1 LA Governor, 1 staff Governor, 1 Headteacher and 11 co-opted Governors. The full Governing Body meets at least once each half term. Because of the size and nature of the schools, we operate a single Federation Governing Body over both Solway and Beacon Hill School, without committees, and convene special committees, such as dismissal, behaviour and so on, as needs arise. 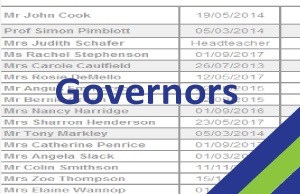 We also convene a special ‘Data Analysis’ meeting prior to each Full Governors, which take place at least once every half term, in order to ensure our Governors can challenge and support the progress and attainment of our students. The last 18 months has been an interesting journey for everyone involved in Solway School in Silloth and Beacon Hill Community School in Aspatria. It’s been obvious from the beginning of our collaboration that working together makes both schools stronger in all sorts of ways – better curriculum offer, greater choice of GCSE subjscts, more extra curricular opportunities, staff working across both schools, and not least students learning how to coexist! Then in September this year, following consultation with all stakeholders, the schools decided to move to a formal Federation arrangement. This does not mean the schools are merging! They remain completely separate entities; we just agree to work closely together, in the classroom and out. And crucially, retaining the benefits of small schools where every student is known personally to staff and class sizes remain optimal for learning. Under the Federation a single governing body has become accountable for setting the strategic direction for both schools whilst each school retains its individual identity – that’s so important to serve the different communities the schools are at the heart of. 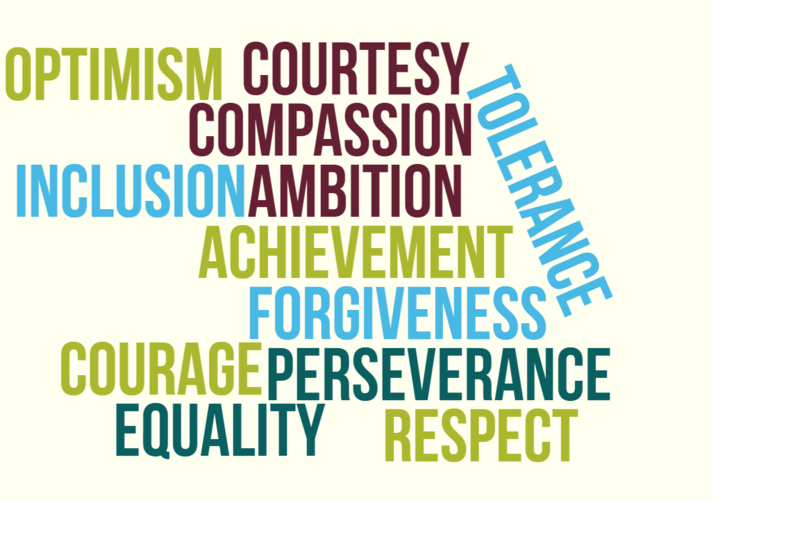 Across both schools the Federation actively promotes inclusion, diversity and equality and provides a properly equipped learning environment where students feel welcomed, encouraged, challenged and, most importantly, want to learn and succeed. The newly formed federation leadership team and governing body have both vision and ambition for each school, and the new Executive Head Teacher is inspiring improvements, raising aspiration and expectations and ensuring new initiatives are implemented across both schools. It’s not a surprise that the strengthened position of both schools has been evidenced this year by the substantial improvements seen in the 2018 GCSE results, Progress 8 scores and every Year 11 student at both schools attaining the qualifications required to allow them to access their chosen next step in education or employment. Please click on the links below to find out more about our Governing Body, our structure and guidance from Ofsted about how we work together to benefit the school.